Strong, but also fresh and neat. Fresh herbs, apple, pear and hints of vanilla. Very smooth! A little dry, but salty and fresh. Hints of lemon. The cask strength produces a nice warmth and the finish is medium-long, nutty and woody. Beautiful herbal appearance with notes of thyme, Dost, lavender green, crushed pepper and roses. This is joined by a vanilla sweetness and marzipan. With water: vanilla, coconut, caramel, seaweed, fishing nets, salt and hints of roses. Lush and soft in the body. With peppery dryness, oak, salt and coastal aromas. With water: softer, more oak, pepper, salt and juniper. Very long, warming, toasted oak, juniper. 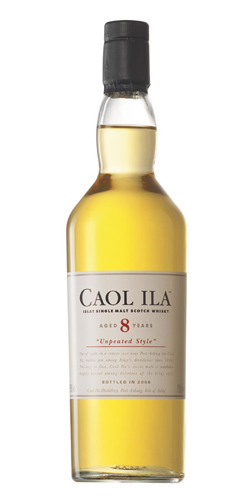 CAOL ILA 8yo / 59.8% "Unpeated Style"
The aroma of grass and herbs, apples and faint bananas, vanilla and toast from bourbon casks. Feeling fruit and herbs feel strong acidity, gentle sweetness and salty bitter taste without disgust. Although feeling the strength of the power, it is a smooth and somewhat oily body. A well-balanced finish with good acidity and bitterness. This is pretty favorable malt. Taste with condensation. Moderate peety in Islay is pleasant, the best taste for feeling mint and herb is Calila. Excellent compatibility with Calila without Pete firing, First fill fill bow cask finish. it still tasted a bit smoky." my favourite 'Highland Style' Caol Ila. system after the peated stuff. Ozone and seashore, iodine and leather. Vanilla pods roasted over a peat fire. Long with woodspice and tannins. Nose gives the sense of power and young age. A lot of fruit and citrus notes, vanilla, toffee, dried fruits, cherry, ozone and freshness. It´s very sweet, condense, and lightly sour with lemon and tangerine in the aftertaste. It´s definitely fresh and completely free of smoke. Long with a lot of sweetness, nuts in honey and citrus notes.